Don’t we look fine and fancy??? 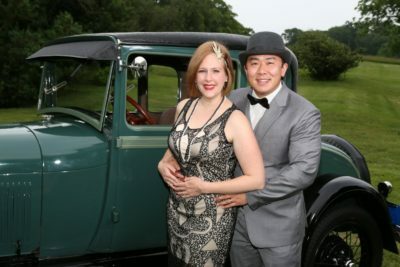 A week or so ago, I attended a local county (Howard County) historical society event called the Great Gatsby Summer Soiree – it was a chance to get dressed up in 1920s garb, drink some adult beverages, smoke some cigars, and take in the beautiful sights of western Howard County. The event took place at a wonderful estate called Oakdale Manor (also known as Governor Warfield Mansion) and we had a great time enjoying games of chance, costume contests, and of course the adult beverages! The most interesting one of the batch was White Tiger Whisky – it’s made with 100% rice. It nose reminded me a lot of the grain alcohols my grandfather and dad used to drink, a very strong alcoholic profile with a touch of sweetness unlike anything in bourbon or other whiskies. It was a lot of fun to sample because you got a bit of the oak maturation character mixed in with an alcohol from a totally different product. The owner/founders of White Tiger Distillery (Itsara Ounnarath) and Lyon Distilling Co (Ben Lyon) were both present, though I only had a chance to chat with Itsara. Of the other three, there wasn’t anything that jumped out of me with one exception — Lyon Distillery. Maybe it was because it was last, maybe it’s because one of the founders was present, but I really enjoyed the story behind the company (bootstrapped, he’s a tinkerer and experimenter, and a big focus on quality and craft). The whisky itself was delicious, nice balance of rye and corn and was a nice way to round out the evening’s tasting. 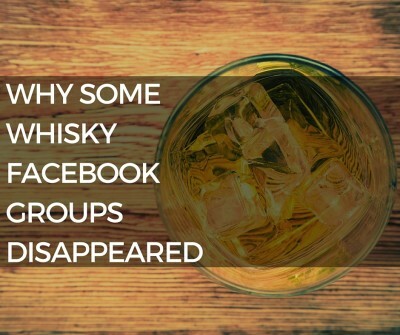 Facebook Shutting Down Whisky Selling & Trading Groups? When I was a kid, I used to collect comic books, baseball cards, and all the other fun toys kids my age collected. I told my mom that they would be worth a lot one day! Fast forward to today and you can replace comic books and baseball cards with whisky and you can replace my mom with my wife! Now I am hardly the collector, there are many in our Facebook group, with massive and very impressive collections. With the advent of Facebook groups, it’s far easier to find other collectors like yourself and build your collection for those rare bottles you’ve always been looking for. One day I’ll pick up something distilled and bottled in 1980, the year I was born, but I probably shouldn’t wait too long… the price will only go up! The interesting thing is that anyone who sells alcohol without a license is breaking both state and federal law. The Facebook groups that facilitated the transactions weren’t breaking the law but the people doing the selling were. I kept it that way not because I was cognizant of the law but because I didn’t want anyone to get scammed through the group! By keeping it to enthusiasts only, we could share ideas, thoughts, and experiences without having to wade through the usually offers of this rare thing and that. There are a lot of conspiracy theories floating around too. The disappearance of whisky groups coincides with the disappearance of popular cigar trading groups and gun groups, so some speculate ATF is involved. Just a couple weeks ago there was a NY Times article about Facebook groups and guns, which strike me as a far more serious issue, but could’ve brought the bright light of the law into the darker parts of Facebook. If your favorite group has been deleted without warning, it’s probably because Facebook thought there was buying and selling. We don’t do either and welcome you with open arms! Reader Gary recently went to a Laphroaig tasting being held at Binny’s Beverage Depot, a chain of liquor stores in Illinois. The event cost a mere $10 and was hosted by Simon Brooking, Laphroaig’s North American Whisky Ambassador. We walked into the tasting room and the first thing that hits you is smoke. A lot of smoke. All the tasting were already poured, 6 per person. This night we got to taste the Select, 10yo, Quarter cask, Triple wood, 18yo and finished with the Cairdeas from 2014. Simon greeted us all and then started out with a song. Then he started in with the history of Laphroiag, and how they became a legal distillery in 1815, but they had been distilling illegally for a while. Simon did not say exactly how long the illegal part was going on, but it was for “some time”. Simon then went on to explain how to nose the whisky and how having your mouth open is important, as it allows you to get more aromas and not just the alcohol coming out of the glass. We started with the Select, which I liked very much. The select is a blend of the 10yo, the Quarter cask,Triple wood, and PX. A good place to start since the select does not have the typical heavy smoke nose or antiseptic tastes that the 10yo has. Still some smoke on the nose, some fruit, smooth, not too much peat at the end. And Simon does a toast with every dram. Some toasts are in Gaelic, some in English and one in Spanish. Simon then produced a piece of peat, nice big chunk. He explained how the peat was used to dry the barley, and how the peat smoke added that unique flavor to the barley. Simon also explained how they farmed the peat. They go down 9 inches, put that to the side, then go 18 inches put that to the side, and then use the next 18 inches. Put the first two pieces back, which makes the whole process more sustainable, and you get a more consistant flavor of peat digging so deep. Simon then proceed to start the peat to smoking and let us all get a good whiff of the smoke. It was also discussed that some people use the peat to smoke fish or meats, and that if you get some of the barley that has been dried it makes an excellent batter for food, get some nice smokey flavor. We then went to the 10yo which I liked very much. Smoke just pouring out of the glass, taste of a camp fire in the mouth, then floral, antiseptic, then more smoke. Long finish but very enjoyable. With a bit of water the floral, fruity notes really pop out. After the 10yo we tried the Quarter Cask.Not nearly as smokey as the 10yo. Still nice but the oak really comes into play. Many of the others liked this quite a bit, but not my favorite. Then more information. Such as it can get very dry during the summer and the water supply for Laphroaig can dry up. So if you are planning a summer trip to see the distillery and see them actually making alcohol you probably should call first. They may be waiting for rain to fill up the lake. Also the 18yo will not be offered next year. It seems that is already happening since many of the local stores here have no 18. Other than Costco. Laphroaig will be offering a 15yo in 2015. They just don’t have the stocks which makes sense due to the demand for single malts. Okay so scotch, Triple wood was next on the tasting. Less smoke, alot more mouth feel, oak of course, and nice finish. Then the 18yo. Where did all the smoke go? Not nearly as much peat in the nose or the palate. Much more of the floral fruity notes, easy to drink, medium finish. My sons like this one quite a bit. Finished up with the Cairdeas. Wow nice scotch. Aged in oak and then finished for a year in Amontillado hoghead sherry cask. Not your typical Laphroaig. Smoke, sherry, complex for sure, very pleasant, smooth. Great way to finish the evening. A little tip from Simon, if you aren’t sure what year Cairdeas you have look at the ABV. Last year it was 51.3%, this year is 51.4% so next year should be 51.5%. Laphroaig is 200 next year, (legally) and they plan on having a big celebration during Feis Ila, but are planning on a second celebration since they feel so many people are wanting to come to the distillery and take part in the anniversary. Other note Laphroaig uses only Makers Mark barrels to age their alcohol. They feel Maker Mark fits the best with their alcohol. we scored some nice swag from Laphroaig, and heavy duty pen, a stainless steel flask, plus a wonderful spread of bread, meats and cheeses during the tasting. Even have a photo with Simon and a few bottles he signed for us. Laphroiag really does it up right. If there is a tasting in your area it really is worth checking out! Sounds like a fun event worth way more than $10! 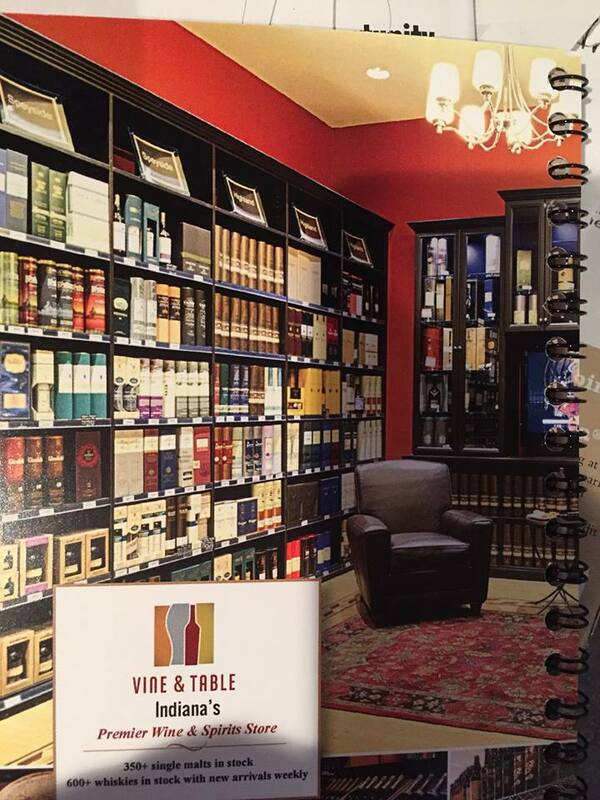 Reader Nancy recently went to the Indy’s 6th Annual Whisky & Fine Spirits Expo, presented by Vine & Table (a wine and spirits store in Indiana), and I asked her if she could share her experience at the event… and she happily obliged! It sounds like a fantastic event, I’ll let her share what it was like. Hosted by my favorite liquor (read “scotch”) and gourmet food store in Carmel, IN, it was held at a beautiful reception facility on the north side of Indy called the Montage from 5pm to 9 pm. Tickets came in 3 varieties, VIP, Regular and Designated Driver. Doors opened to VIP’s and DD’s at 5, and an excellent buffet was available to them until 7. Doors opened to regular attendees at 7. Everyone was given an appropriate armband. VIP’s and DD’s were given a “goodie bag” containing a booklet with maps, lists, and locations of spirits and a tasting glass etched with “Vine and Table”, a copy of “Whisky Advocate”, a voucher for a gift set of Glenmorangie, and a voucher for $30 off a ride home (if needed) from “Uber”. (DD’s did not get the glass, but had a wide free selection of soft drinks and water available to them. There were 55 (54 spirits, one with cigars) tables in two rooms and the VIP wristband allowed for the tasting of most of the higher end offerings, and any of the lesser spirits. The emphasis and majority was whisky (of ALL types), but there was Cognac and Armagnac, a few vodkas, tequilas and mescals, grappa (and a couple of grappa/wine blends that I didn’t taste), and maybe some stuff I missed. All 389 selections available could be purchased at a discounted price for later pick-up at the store. There were also two classes offered (neither of which we attended, as we had Gladys Knight tickets at 8 pm). 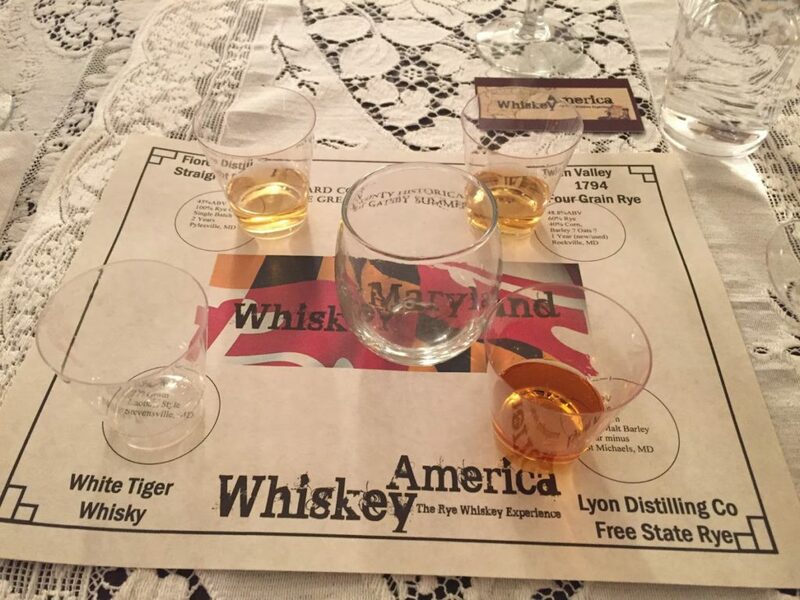 One was “Bourbon Straight Up: An Inside Look at America’s Spirit”, with Chuck Cowdery, author and whisky expert. And “The Art and Science of Whisky Blending: Deconstructing Johnnie Walker Black”, with Kyle McHugh, Master of Whisky for Diageo. It was a fabulous evening and we noticed car tags in the parking lot from 5 or 6 surrounding states. I am now on the email list for Vine and Table, so will be happy to post a notice here when I get it information for the 7th annual. 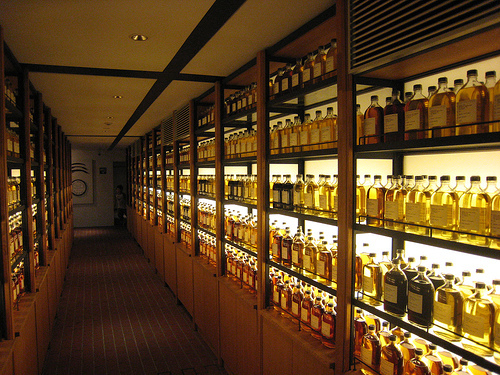 [Here] is a photo of 2 sides of the 3 sided whisky room at Vine and Table. Did you know that there’s a National Scotch Day!? This year, it’s July 27th! As in this Sunday! But honestly, who cares? It’s not like we need an excuse to enjoy Scotch in the first place. National Scotch Day isn’t the only named “day” to celebrate the spirit of Scotland, there are several others and most of them, like any of these Hallmark holidays, have commercial origins. But honestly, who cares… it’s fun. International Whisky Day was recognized on March 27th, 2014. That particular date has a clear meaning – it’s the date of Michael Jackson’s birthday (the famed whisky writer) and was started in 2008 to celebrate his life and raise money to fight Parkinson’s Disease. World Whisky Day happened to be May 17th, 2014. World Whisky Day started in 2012 and was started by Blair Bowman, a student at the University of Aberdeen, and it’s grown to be a pretty big event each year with a ton of sponsors. According to their estimates, over 20,000 people took part in WWD last year. Whatever day it might be, it’s always a good day for whisky! The one thing I do like about National Scotch Day is that there’s no central body that has “claimed” it. There are organizations behind the other ones and they hold a singular central event. 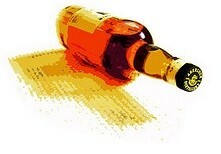 With National Scotch Day, it feels more organic because there isn’t some fancy website and sponsors and all that jazz. It could be that I didn’t look hard enough or it’s because true aficionados are too busy celebrating a dram! What do you plan to do on National Scotch Day?